Here at TechwareLabs we’ve reviewed our fair share of NAS’s from manufacturers like Synology, LaCie and even Patriot. This is our first entry from Western Digital in this front though. Today we take a look at their Sentinel DX4000. This 4-bay NAS packs a whopping 12TB of storage to satisfy your data hoarding needs. 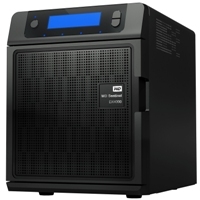 Western Digital may know a thing or two about storage, but does this translate well into the appliance NAS market. Follow us as we take a look at how the Western Digital Sentinel DX4000 stacks up. What makes you think this is a pci-e connection instead of just a similar form factor connector using Sata/SAS signalling ? When I read your comment I went ahead and disassembled the NAS again to make sure I hadn’t missed something. There is no discrete RAID chip connected on the backplane. It is instead using an Intel ICH9R chipset on the motherboard for hardware RAID. As far as the PCIe not actually being what it looks like, it appears that we may both be correct. Some motherboards are able to use their PCIe slots as SATA ports, but still retain PCIe functionality when a drive isn’t plugged in. I think that may be what they’re doing in this instance. All that being said, I can’t really see the point in enabling a RAID 0 on a device like this. It’s main purpose is to keep data safe, something completely defeated when using RAID 0. I could see you wanting to use something like RAID 1+0 though. Well with dual GBe and sudo software raid that the ich 9r provides you will probably limit throughput by the ich9r chipset or cpu. In some situation with multiple people accessing large files at the same time performance can really degrade, so a raid 0+1 would provide better throughput because of less overhead in the parity calculations. With some enhancements a raid 0+1 can read just as fast or faster than a 4 disk raid5 (again parity calculations, more read heads available with less processing overhead delays), just like in some cases a 2 disk raid 1 array can read faster than an identical single drive on the same controller (read optimization’s, more heads available).